Laos is home to a large number of ethnic groups, many of whom still wear all or part of their colourful traditional dress, especially for festivals or weddings. Although the Lao government recognises 68 ethnic groups in its territory, some sources identify as many as 150 groups. What is certain is that Laos is home to an incredibly diverse population with a corresponding variety of traditional dress. Hive Bar in Luang Prabang showcases a selection of these vibrant traditions 5 nights a week in a lovely garden setting. Around 100 outfits are modelled by 20 students who the owner told me are paid well, and rely on this income to continue their studies in town. Although I generally shy away from tourist shows, I’m glad I checked this one out while I was living in Luang Prabang. Although the clothes worn by these models were not all as traditional as the ones I had seen in more remote villages, they were not artificial as some I’d seen in cultural shows in China, Nepal and Thailand. Even the components that were made from imported machine-produced polyester and plastic beads were the same as those I had seen being worn by Lao people at their own authentic festivals, and were teamed with many pieces that were handwoven and hand embroidered. The models demonstrated how to put on some of the headgear, and it was good to see young locals wearing traditional dress with pride and pleasure. I hope it proves positive for these models to see how much interest is shown in their culture by the foreigners whose lifestyles and dress the younger generation admires and emulates. Perhaps this generation will successfully navigate the rapid transition of their country into the 21st century, assimilating outside influences selectively & wisely, and taking advantage of new opportunities whilst simultaneously maintaining those aspects of their traditional culture they consider valuable. 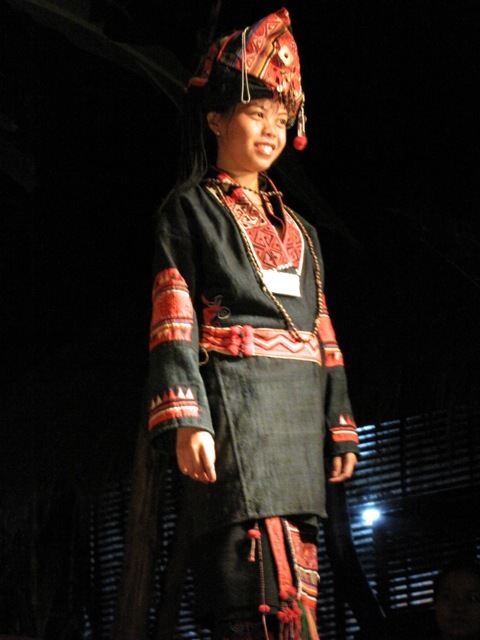 This entry was posted in Laos and tagged Asia, costume, ethnic, ethnic textile, Laos, Textile, traditional by Wendy Garrity. Bookmark the permalink.